The Wigmore Hall is situated just round the corner from 10 Bentinck Street, the first of several apartments Chopin rented during his visit to London in 1848. His Scottish pupil Jane Stirling - who had made most of the arrangements for his stay - and her sister Mrs Erskine, lived nearby at 44 Welbeck Street. 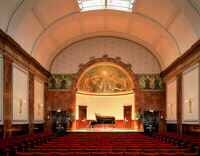 See the official website (www.wigmore-hall.org.uk/about-us) to find out more about the Wigmore Hall and its history. By train or underground: The nearest stations are Bond Street (Jubilee and Central lines) or Oxford Circus (Bakerloo, Jubilee and Victoria lines). By bus: Many buses serve Wigmore Street. Check with London Transport's website www.tfl.gov.uk to find which is best for you. By car: There is limited street parking after 6.30 (Mon-Sat). There are car parks in Cavendish Square, Harley Street and Marylebone Lane, all less than 5 minutes walk from the Wigmore Hall. See the Wigmore Hall website www.wigmore-hall.org.uk/visit-us for map and full instructions.